HHS is responsible for implementing many of the provisions in the Affordable Care Act of 2010. CLASS is one of those provisions. It is a new national, voluntary, federally-administered insurance program. Within HHS, the Administration on Aging (AoA) will set premiums, benefits, and rules for enrollment and benefit eligibility. CLASS is not available yet. 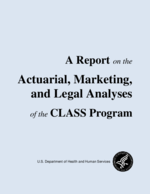 The law requires the Secretary of Health and Human Services to designate the CLASS benefit plan by October 1, 2012. Enrollment will begin sometime after that announcement. Once CLASS is available, eligible working adults age 18 or older will be able to voluntarily enroll in this new program either directly or through their employers. Individuals who enroll and meet specific requirements regarding functional limitation, earnings, and premium payment will be eligible to receive benefits to help them remain independent. Details on enrollment, premiums and benefits are being developed and are not available at this time. Please visit http://www.aoa.gov/class for additional information on CLASS.